Rose is lucky to have her own little girl to cuddle with! 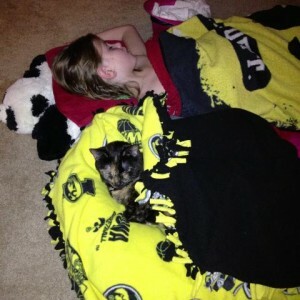 In this picture, the little human had just tucked Rosie in her bed when she fell asleep herself. Thanks so much to the little girl’s mommy for letting me share them as Guest Cuddlers! I just recently adtpeod a kitten and I already have a cat. And after the hissy fits subsided, they started eating the others food. The kitten eats the cat food, the cat eats the kitten food. I put the food bowls in separate rooms But they just go to the other bowl and eat out of that one. What do I do? How bad is it for a kitten to eat cat food? Or a cat to eat kitten food? The adult cat might gain weight because the kitten food is very rich. In our house, when kittens decide they want to eat adult food rather than kitten food, we just switch. What a lucky kitty and little girl to have each other to cuddle with! Thank you for posting the photo. Purrrrrrrrrrrrrrs. I can personally attest to the fact that this little girl gives WONDERFUL cuddles!